THU A AUG, 8.30PH, ITV Corrie's Catherine Tyldesley (aka Eva) goes all TV presenter on us for this Tonight docu where she asks that all-important question -is it worth going on a "quick fix" diet for our summer hols? Here's hoping the answer is no ('reaches for the choccies) as she runs through the immense number of slimming fads out there and finds out what impact weight loss has on our minds and bodies..
SPORTY! FRI 5 AUG, 8.30PM, BBC1 With (ust hours to go until the nation goes sports mad as Rio 2016 kicks off. 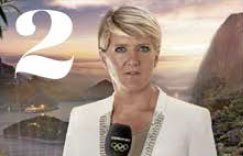 Clare Balding looks ahead to the Olympics in the company of some of the most famous Olympians of all time. Jessica Ennis-Hill. Mo Farah and Bradley Wiggins share their thoughts and, later on this evening, it's the almighty opening ceremony - whoop!